I was driving the other day near my house and came across a road called “Lonesome Oak.” I started thinking about human beings’ tendency to project human emotions on nature (which we so often do). Many in our society view Oak as the loneliest tree. I grew up attending a small school in the country and know from my schooling there that Oak trees have to have enough space in the soil for their complicated root systems. Other trees cannot be planted next to an Oak if you want it to be healthy. It never dawned on me as a child that the Oak is a lonely tree. The tree receives all the nourishment it needs from it’s personal sources: the Earth below and the Sun above. It does not need tree companions to do what it is in existence to do: grow. However, I can see from a very physical perspective how an Oak could look lonely to the untrained eye because the tree is often alone from other trees. 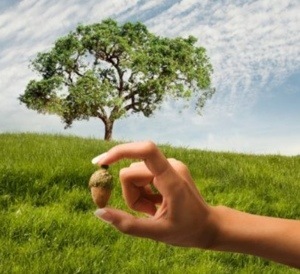 Consciousness can essentially be explained in an acorn. Humans can be viewed like an Oak tree. From a physical perspective, human beings could look very lonely on their own. Many people who live an unconscious life actually become scared to be physically alone since they cannot see beyond the physical veil. Like the roots of an Oak tree into the Earth, our minds are connected to infinite energy and consciousness. We can harness energy and knowledge from the source without needing to take the energy and resources from our peers. Like the Oak tree, the natural state of consciousness is to grow and expand. If an Oak tree decided to be planted next to another Oak tree, both Oak would experience less than prime health. When we lean on our fellow men instead of the one true source within us, our understanding becomes limited. We can do this on our own. We do not need a priest, a temple, a guru friend, or any external guidance. Living a conscious, healthy, and positive life can plant future acorns of peace for future generations of Oak Trees to grow big and strong. Since all human conflict arises out of the appearance of lack, take a moment to imagine a world where everybody had enough abundance to go around because of the eternal and personal connection to source. Looks pretty amazing, right? Some say it would be chaos without the man made rules we impose on ourselves, but those in the know understand that reestablishing a personal connection to the divine source diminishes any seeming conflict. Abundance for all is within our reach. It is our challenge this life to bring peace to a world who is just beginning to understand what true abundance looks like. Peace on Earth is not only very possible, but completely attainable for everyone.